"Nice and clean, friendly staff"
Have a question for M Citi Suites? "Very clean and very accomodating staff"
"reasonable value in the Plaza Divisoria part of the city." "Thick and comfortable beds, clean facilities." 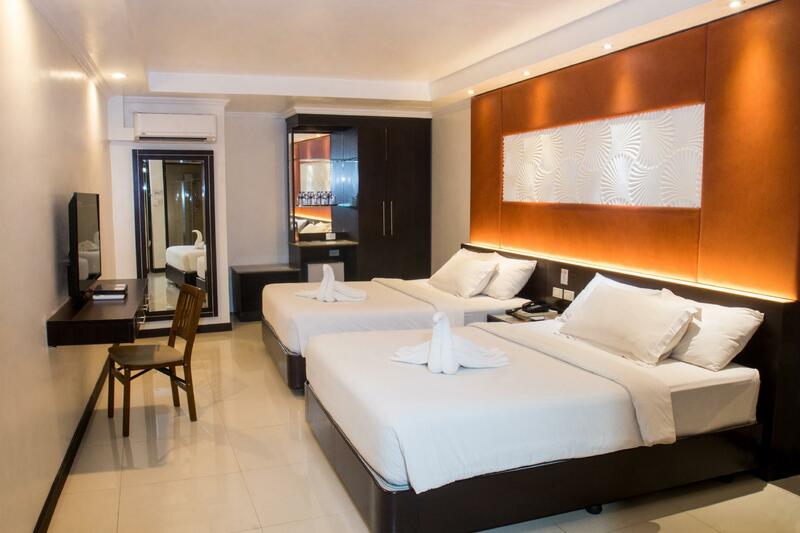 Offering quality accommodations in the nightlife, shopping, restaurants district of Cebu, M Citi Suites is a popular pick for both business and leisure travelers. The city center is merely 0 km away and the airport can be reached within 40 minutes. With its convenient location, the hotel offers easy access to the city's must-see destinations. At M Citi Suites, every effort is made to make guests feel comfortable. To do so, the hotel provides the best in services and amenities. This hotel offers numerous on-site facilities to satisfy even the most discerning guest. All guest accommodations feature thoughtful amenities to ensure an unparalleled sense of comfort. The hotel's massage are ideal places to relax and unwind after a busy day. 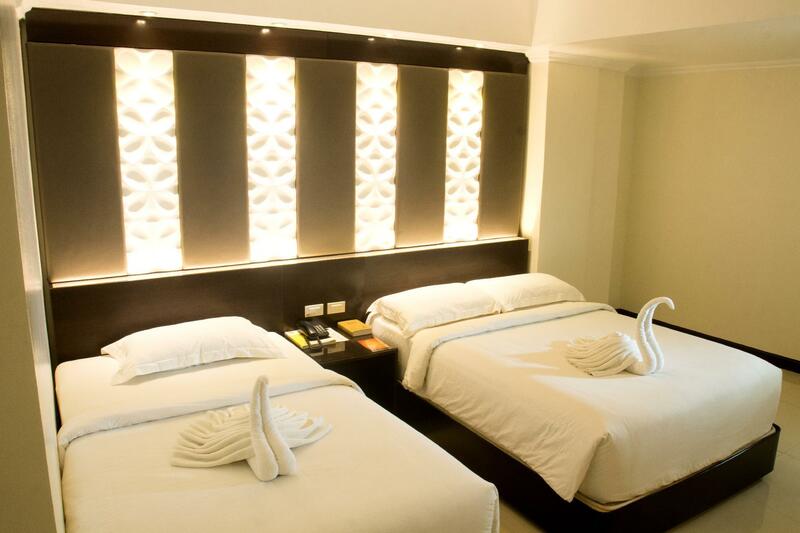 M Citi Suites is an ideal place of stay for travelers seeking charm, comfort and convenience in Cebu. "Very very good,staff,location,room and the whole stay was aw..."
Found this place as a last minute deal and was pleasantly surprised on the quality of the room. We checked in after 5pm and still had to wait for our room to be readied which sort of sucked but the front desk provided us drinks while we waited. Room was nice and bed comfortable. All bathroom supplies were provided and plenty of pillows and sheets/towels. I would stay here again. Everything is good except for the FO lady in the evening. She was too preoccupied that she never smiled and was so rushed- seemed dismissive when people were checking in. Grace under pressure is important especially if you are a frontliner. The restaurant staff on the other hand is nice and very attentive. They delivered a prompt service and very accommodating, the lady went extra mile to check about my hair dryer request, which is not within the scope of her duties as a waitress. Gesture, big or small should be recognized. Good job! The man who assisted me in getting a cab is also very accommodating. He proactively called for a cab under a rainy weather and even said thank you as I went inside the taxi. I appreciate the act of hospitality. The food, location, and room were good and worth the price. 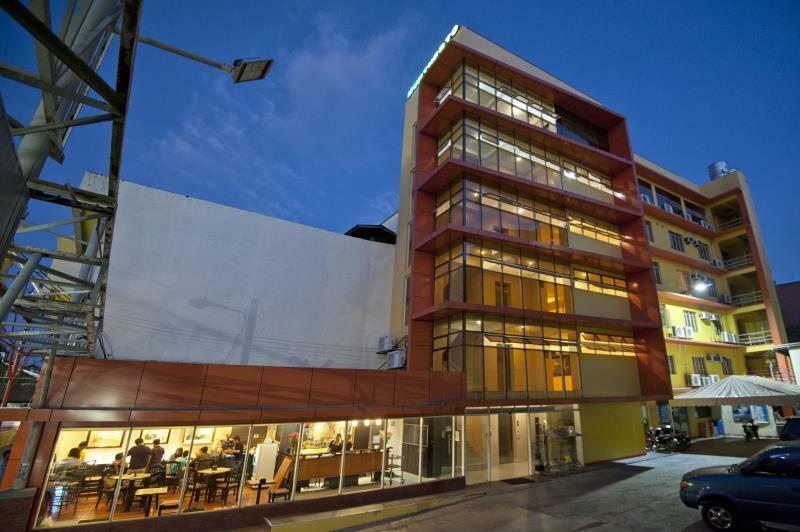 The hotel is situated at the heart of Cebu City. It is just few steps from the Fuente Osmena Circle. Accessible to Ayala Center, SM Seaside City, Robinson's Cybergate, Robinson's Fuente, and Robinson's Galleria. They have free breakfast (Filipino, American or Continental). the hotel may be small but it has everything you need. location is very convenient and accessible. check in and check out was fast. helpful staff and they serve good plated breakfast. tried their other food found in the menu and their servings are huge. i was amazed with the big portions they are serving plus the taste is really delicious. would definitely come back here. the only downside was that the heater in the bathroom was not working. water temp was not that cold that's why we did not bother to complain. the sink got clogged up during our stay but they were very fast in fixing it. i will definitely recommend this place. good thing we were able to get a discount from agoda. Great location. Helpful staff. Value for money. Good facilities. Nice place comfortable bed friendly staff, I booked with Agoda breakfast included paid cash at the hotel no early check in fees and you get to pick your breakfast from the menu!!! We needed a hotel close to Chong Hua Hospital. It was within walking distance which was great. The staff were all very helpful and courteous. Food in the restaurant below was good. The shower didn't work as well as I'd like. Overall it's a good value for your money and I'll stay there again. Stayed here since our new born baby was in the ICU. Very near to Chong Hua Hospital. Room was big enough for us since we got the good for 4 even though we were only 2. Staff is very approachable. Wifi is working. I recommend this hotel to business travellers who are in budget. In the heart of the city. Family of 3 pax. Stayed on the 4th floor. Perfect location which is near marts, fastfood chains, atm, casino, and bars. A jeepney ride to Colon street, Capitol, or Ayala Cebu. 24h reception which was convenient for late check-ins. Free local calls using the room phone which was crucial for late night food deliveries and travel bookings. The room was spacious and clean. All deluxe rooms have no window but it was not a big deal for us because the aircon was working well. Maybe, they can improve on the fixed shower and hot water. It was hard to maneuver around the glass cubicle because the shower was fixed and the water was not strong. But our overall experience would be 9/10. M citi suites hotel is good for bussines and travelling SEBU island and walking around City but in the room no slipper and Refrigerator and hot shower. if you need the 3 of kind up you should find other hotel. It was my 4th time at M Citi Suites, in a city where I've been in more than a dozen hotels. It is centrally located, at a street just a few hops from Jones, and a block from Fuente Osmena. Their rooms are spacious and very clean, the staff very accommodating. I came back late one evening and found my bathroom door locked (the cleaning staff locked it probably accidentally) and it didn't take a minute to get someone to fix it. Another time I was there with my family, their wifi signal wasn't working properly so they brought a modem inside the room so we had internet connection all for ourselves, and it didn't take forever. They seem to make it a habit to respond as soon as possible and provide whatever is available, and that speaks a lot about customer service. I booked a standard room but got upgraded to a deluxe because all their standards have been filled up - and though it isn't any fault of mine, I was grateful nevertheless. They didn't even think twice and accepted my early check-in at 8:45 AM, though officially, check in time is after lunch. Now what other hotel would do that? Tune Hotel lets you wait, so does Best Western Lex along Escario. Bathroom is very clean, water pressure is very strong, fixtures working. At that price, what other hotel has a ref? Its really hard to find fault. If they included an inclusive breakfast in their rates, they'd be perfect because their restaurant serves some of the best food - try their Hummmba, and their pasta carbonara. Also, there's no P1000 deposit that other hotels nearby ask for, like Adelfa just a couple of blocks from M Citi. Cuarto Hotel just across really pails in comparison in terms of interiors and amenities, and cuarto charges almost double for their type of rooms. What's better, Chong Hua Hospital is a few steps away if you have medical concerns; Robinsons Cybergate Mall is just round the corner - you can do printing (e-tickets and webline check ins, etc) at Cybergate's Business Hub. 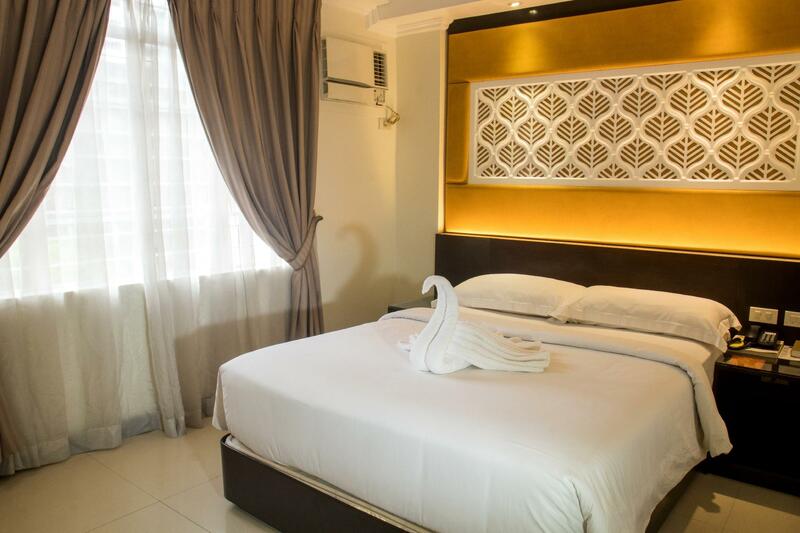 There is so near of the Mango avenue and Robinson mall, and so cheap room, New hotel. I think, the room is small, but if you stay just 1 night for going to another place, it's good. It's new hotel, i think, some texi driver don't know this hotel, and i explain about the CheongWa hospital. But there is so near of the Fuente Osmenia Circle, and Robinson mall. Room condition is very nice, I think, so clean, and hot shower, another, but room is small, i feel. The room is standard and ok for its price, but the staffs are so friendly and helpful that it exceeds our expectation. We ended up extending two more days here and our 19-month-old baby was very happy too. Overall, it's a budget hotel with professional staffs! My friend left her branded jacket and the staffs were very accommodating to ship the item back to Manila. Also, it's centrally located and public transpo is not a problem. For a budget hotel - comfortroom is really amazing. For double rooms it could have been better if windows are available inside the room. Near Robinsons Fuente. Near Robinsons Cybergate. Neat. This is a decent family friendly hotel right smack in the middle of Metro Cebu. They have a cafe restaurant where you can order your meals. You can stroll along Fuente Osmeña Circle since it's nearby. The room was very comfy. And very reasonably priced! Huge clean rooms with comfortable bed. Centrally located, easy to get taxis at any time of the day. Jones is just a block away and so are restaurants, malls, etc. Accommodating staff, fast check in and check out. Fast room service and good language skills for the staff. Really one of my favorite hotels in Cebu and it's my 3rd time this year alone. My 3rd time to stay here this year. As there are lots of hotels to choose from in Cebu, this speaks a lot about how I feel about M Citi Suites. I booked two rooms: one deluxe and one family suite; both emply huge space, huge comfy beds you don't want to get up after you've laid down the bed; huge bath clean bath rooms too. It's centrally located, just a block from Jones and a short walk from Fuente Osmena, Robinsons Mall, restaurants, the leisure strip of Maxilom, etc. Restaurant has a good list of options, but pricey. no problem there though since you could walk to nearby restaurants even in the wee hours of the morning. Only minus point: the doors don't have door bells so people knock instead of just ringing the bell which could be bothersome to the nearby rooms. Fast wifi too. Very accommodating staff and even faster service. When you need something fixed, their service personnel would come by your room in a jiffy.